Montreal, 2011. Antoine (Kevin Parent) is turning 40 and has it all. He is in good health, has a high flying job, no financial worries, a beautiful loving partner and two wonderful daughters. Paris,1969. Jacqueline (Vanessa Paradis) is a single parent fighting to bring up her 7 year old son Laurent (Marin Gerrier) who has Down‘s syndrome. Their two stories intertwine across the divide of time and location in Café De Flore. Jacqueline loves and adores her son and will do anything for him. At the special school in Paris Laurent becomes attached to Vero (Alice Dubois), a little girl also with Down’s syndrome, and the two become inseparable to the extent of throwing tantrums when they have to part. This places increasing burdens upon Jacqueline leading to some hard decisions. In Montreal we learn from flashbacks that Antoine’s current partner Rose (Evelyne Brochu) is not the mother of his two girls; this is Carole (Helene Florent) who had been married to Antoine for 20 years until Rose had come onto the scene two years previously. Carole still loves Antoine and the two remain on friendly terms, sharing their daughters. But Carole is having some disturbing dreams about a child, and is seeking some explanations. Café De Flore is a film that develops slowly, only gradually revealing its secrets. It changes frequently between the two main time zones, but also adds another layer with the early relationship of Carole and Antoine. To increase the dislocation the film uses brief recurring images that are not explained, but the main disorientation, and indication that all is not as it seems even in the early scenes of Antoine’s happy family, are snatches of Pink Floyd’s music from the Dark Side of the Moon album including Breathe in the Air, Speak to Me and Time. Indeed, music is at the heart of Café De Flore, with the song of that name being one of the first hints of the connections between 1969 and 2011, while Sigur Ros, The Cure and Nine Inch Nails among others feature on the soundstage. Café De Flore takes its time to develop with situations of genuine pain. The acting from all the cast is wonderful, without a false note anywhere; Vanessa Paradis and Helene Florent are achingly good, while the two children with Down’s syndrome, Marin Gerrier and Alice Dubois are stunning. Despite the complicated plotting, at its core Café De Flore is a poignant film about love, music, connections and finding your soul mate. Whatever you may think of the denouement, Café De Flore from writer / director Jean-Marc Vallee is a beautiful and moving film about people the viewer cares about very much. Highly recommended. 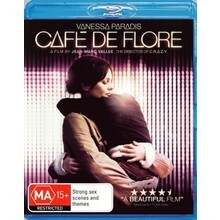 Café De Flore is presented in an aspect ratio of 2.35:1, the original ratio, in 1080p using the MPEG-4 AVC code. This is a lovely print with crisp, sharp detail. The sequences in Paris have a darker look, with a browner colour palate, but this is not overdone and colours generally look natural throughout. Skin tones are natural, blacks solid and shadow detail good, not that there are a lot of dark scenes. Other than very slight ghosting with movement against a mottled background, artefacts were absent. Burnt in English subtitles for the French spoken in the film are in a smallish white font. They are mostly easy to read, except occasionally when over a light coloured background. I did not notice any spelling or grammatical errors. Audio is a French DTS-MA HD 5.1 which includes a lot of English as well. The dialogue is centred and easy to hear. The surrounds include some ambient sound and the odd engine, but are mainly used for the music. The subwoofer has little to do but burst to life adding heavy bass to the music at the dance party. The score consisted of music by Pink Floyd, Sigur Ros, The Cure, Nine Inch Nails, Creedence Clearwater Revival, Cole Porter among others. It was an integral part of the film and was nicely rendered in the audio track. I did not notice any lip synchronisation issues. This is not a film that requires an aggressive soundtrack. What we get is perfectly adequate for the film. No extras – unless you count the DTS sound check. Do a sound check of your speakers – 5.1 and 7.1 options. There is no Blu-ray release currently of Café de Flore in either Region A US or Region B UK, although DVDs are available. There is apparently a Region B French release but I cannot find any details of specifications or extras. So in that case Region B Australia wins. Café De Flore is a moving, beautiful film about love, music, connections and finding your soul mate. It has a soundtrack that wonderfully utilises Pink Floyd and others and a conclusion that remains with you after the credits roll. The video and audio are good; there are no extras.